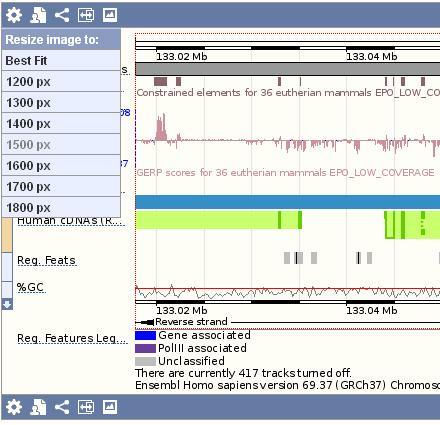 Please note that the archive website for Ensembl release 68 (Jul 2012) will be retired in September when version 82 is released. This is in accordance with our rolling retirement policy, whereby archives more than three years old are retired unless they include the last instance of the previous assembly from one of our key species (human, mouse and zebrafish). For more information about how to use archives, please see our previous blog post on the topic; a list of all current archives is available on the main website. Please note that the archive websites for Ensembl release 57 (March 2010) will be retired in mid January when version 70 is released. Did you ever wish you could resize our images/views to make them bigger? We now have a new icon on the blue image toolbar in beta.ensembl.org, and you can resize the image on one click. On clicking the icon, a menu to choose the size will appear with your current size greyed out (see figure below). There is also a best fit option which will resize the image according to your screen resolution. 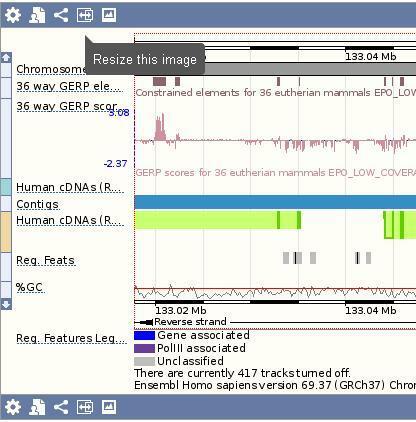 Have a look and let us know your thoughts by sending them to ensembl-beta@sanger.ac.uk or by clicking on the black feedback button at the right of the views in Ensembl Beta. Is the menu clear enough?